Experience the deep, soft seating and cozy casual style of Bassett’s reclining sectionals. Stop by one of our many showrooms and check out the incredible selection of styles, materials, and options available to match your existing decor. Our high quality steel reclining mechanisms are the best available, and provide years of smooth effortless use. Every reclining sectional we build is made with painstaking care and attention to detail. Our objective is to create a furniture piece that maximizes comfort and beauty – the kind of comfort that encourages the entire family to gather round and beauty that is worthy of the Bassett brand. Reclining sectionals have a number of components or individual pieces that can function by themselves or in conjunction with each other. This is universal, regardless of where you purchase your reclining sectional. With Bassett however, there is one key difference. Simply put, our furniture is built to last. We search the world for the finest materials and source only the best fabrics and leathers so that you can be confident your upholstery is the highest quality. We have over 800 fabrics to choose from, so you can get a reclining sectional that fits your style. When it comes to quality and selection, we have no equal. After a long day at work, there is no better landing place then your reclining sectional. At Bassett, we want to make sure that every aspect of your reclining sectional experience says “relaxation”. Find a Bassett showroom location near you and make an appointment with a Bassett design consultant today. 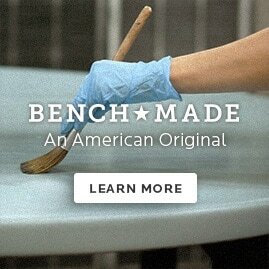 See why Bassett has been the first name in fine furniture for over 100 years.